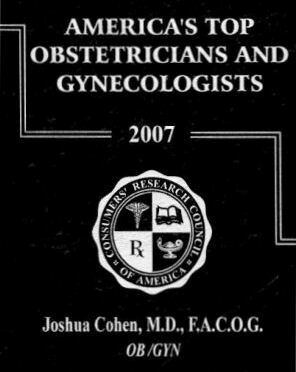 Dr.Cohen's practice is dedicated to gynecology and primary female health care. Dr. Cohen and his staff team are unique in respect to their history, experience and excellent community-wide reputation. They are competent, knowledgeable and provide quality care that emphasizes respect and concern in dealing with their patients. Dr. Cohen is gentle and sensitive in his approach of handling each and every gynecological need of his patients. He listens to his patients carefully and consciously and responds to their needs seriously and sensibly. He is very conservative in his approach and open-minded in Alternative and Holistic Medicines. With ever-changing methods and advances in women's healthcare, he is familiar with the latest in advanced diagnosis, prevention and treatment of women's health conditions. Dr. Cohen has been recognized both locally and nationally as an expert physician. He has consistently received high peer reviews for his practice of medicine in his community. "Good health is our most valuable wealth."